Below is a day-by-day itinerary for the Land of Kings Tour. This is how we expect the tour to flow, but as you know…adventure happens! Dive in and get excited! You’ll board a bus from your hotel at 7am. A 4-5 hour journey will bring you to Bharatpur at around lunch time. After lunch, you’ll be briefed on riding conditions & safety for the trek ahead. It really begins! Soon after breakfast, you`ll start your motorcycle tour and head towards Sariska, near the famous Wildlife reserve. This area was a hunting preserve of the Alwar state and it was declared a wildlife reserve in 1955. It was given the status of a tiger reserve making it a part of India’s Project Tiger in 1978. A safari in the park (next morning) will give you the opportunity to spot some wildlife and if lucky, even a Tiger. Leaving Sariska, you keep heading north-west towards the Shekhwati region, to the town of Nawalgarh. Referred to as the “open air art gallery” of Rajasthan, the entire Shekhawati region is dotted with fascinating mansions (havelis) embellished with frescoes & colourfully painted walls. Later in the evening, you may either explore the town or use the time for rest/relaxation. Joining the NH-11 again, you’ll head westwards towards the city of Bikaner, one of the famous cities of Rajasthan, right at the edge of the Thar desert. Bikaner’s landscape is dominated by the indomitable Junagarh Fort and the red sandstone Lalgarh Palace. 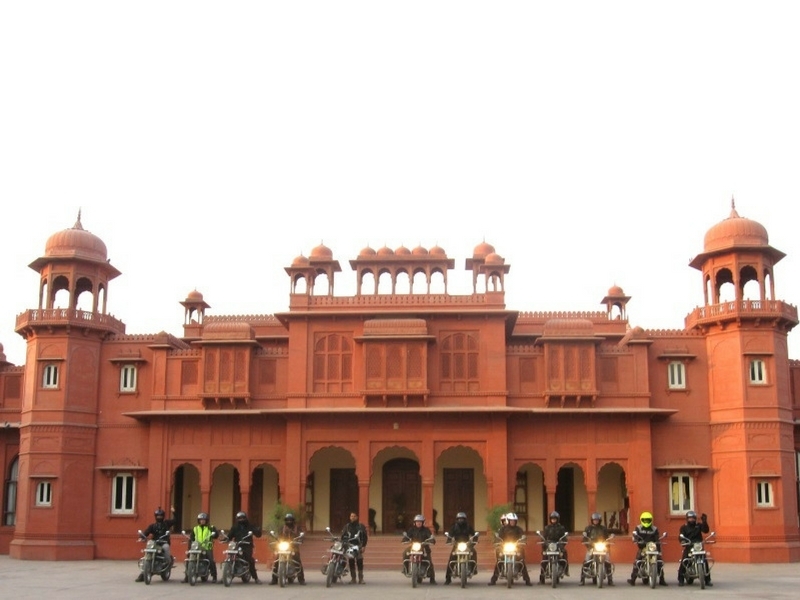 After breakfast, you’ll saddle-up again for a 250 Km ride to the city of Jodhpur. Today our route turns south as we head through the Thar desert into the Marwar region of Rajasthan. The day is yours to visit the places of interest like the impressive Mehrangarh Fort, the spectacular Umaid Bhawan Palace, Jaswant Thada or the bazaars around the clock tower. After breakfast it’ll be time to bid adieu to “the blue city” and take your journey further south towards the Aravali hills. On the way, you’ll get the opportunity to make a brief stop at Ranakpur, a small town located in a wooded valley on the western side of the Aravali range, famous for the white marble Jain temple with intricate carvings. Your final destination today will be Udaipur, the city of lakes. 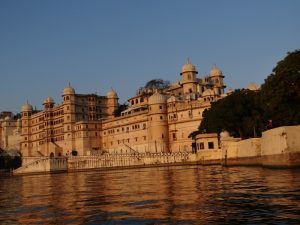 Udaipur, a tourists delight as it is, will most likely have you spending the entire day visiting all it has to offer. The evening will be a great time to absorb the stunning views of the “Pichola Lake” from the sunset point or one of the numerous roof-top restaurants lining the “ghats” around the lake and reminiscing the past few days after you left Bharatpur, as the sun sets. Heading north-east from Udaipur, you first stop today will be the spectacular fort of Chittorgarh, one of the most romantic of Rajasthan’s fortifications. After a visit to the Fort, you’ll ride further 40km to Castle Bijaipur, now a heritage hotel and your destination of the day. 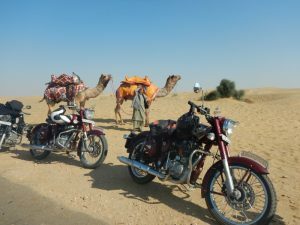 Heading north of Bijaipur, you will be riding on some district roads through rural Rajasthan to reach Pachewar Garh, a more than 300 years old ancestral Castle, in the middle of a typical rural Rajasthan setting. After a relaxing morning at the castle and a late start today, you’ll head towards Jaipur, the state capital of Rajasthan. The day is yours for sightseeing and Jaipur has a lot to offer in that field. A bus coach and an English guide will take you around the most popular spots (0830-1630 hrs). Today, you’ll saddle-up one last time and head back to Bharatpur. Having gone around the best of Rajasthan you’ll be “homing” back to this bird sanctuary. Tonight’s dinner will be a “Farewell” dinner. Today, it’ll be time to say good-bye to the Royal Enfields & Rajasthan. After breakfast, you’ll be boarding a bus coach for the last leg of this journey. However, first stop of the day will be the city of Agra where you will see the most spectacular of the monuments on this tour, The Taj Mahal. From Agra you shall proceed to New Delhi (ETA 1700 hrs). If you’ve purchased a “Farewell” add-on you’ll be transferred to our partner hotel where your accommodation has been arranged. Daytime temperatures on our Rajasthan tours will be in the high twenties and low thirties. However, the temperature can plunge in the late night/early mornings (below 10°C). Thunderstorms are possible so it is advised to bring water-proofs. All Rajasthan tours start and end in New Delhi. The temperature range in winter in New Delhi is 16°C to 21°C. Night time temperatures average 2-8°C. This 2-week circuit will have you up close and personal with the Taj Mahal – don’t forget your camera! People reckon it’s impossible to pack the best of Rajasthan into just 3 weeks. It isn’t. 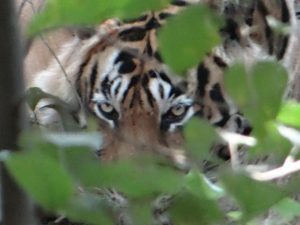 Two weeks exploring the South-East of Rajasthan and walking among the wildlife. It doesn’t get much better.